I love the community and how easy it easy to get things done. I appreciate the help I received moving in and being so close to the town is always nice. This is my second year living at 25 east, and I'm so happy I signed here! The maintenance crew is very responsive and the office staff are always extremely helpful and prioritize residents' needs. My favorite part is the location. It's right on the 26 bus route, a walk away from Meijer and so many other places, and it's surrounded by gorgeous nature and trails. I would (and did) recommend it to anyone looking for a safe, fun, and quiet community to live. Overall my experience has been a pretty good one. One of the biggest things that has bothered me is the WiFi in the apartment being as bad as it is. It makes phone calls and completing assignments difficult. I have resigned for my 3rd year to live at 25 East. There are some drawbacks but overall the price is low and the apartments are in decent condition. It’s pretty lit here at 25 East! Everyone is extremely nice and helpful no matter what you go to the office for! Such a nice place off campus with great amenities. I very much enjoyed my time here. The rent is affordable, the staff is very nice and timely, and the community is quite. We received one random roomate this year and the manager Miranda Scott stated to me before I moved in that they take pride in matching roomates, now he’s my best friend so props to them. Pretty good so far. I like the convenience of the location, and I’ll need to check out some of the other amenities such as the pool and gym in the coming weeks. The office is awesome and the apts themselves are pretty decent! Just wish my rooming situation would have been delt with better:) but I love love love all of the workers they are so nice and always helpful! The staff are always super helpful in addressing my concerns and maintenance is always around to help. The amenities are pretty good for what you pay and even though it’s a little far from campus, the free bus passes are a plus! I really enjoy living here. Its right near a running trail and a crick and is quite peaceful. The staff rocks and is super helpful. The amenities are super practical and you're truly getting what you pay for. 25 East is a good place to stay. Convenient and moderate. Worth the price that you pay to stay here. You will not know how good it is until you experience it. Everyone at the front desk is always so helpful and also very kind. They ask about my day and have worked with me about finding my next apartment! 25 East is awesome. Super great space for the price. The grounds themselves are pretty secluded which is nice because it is away from the bustle of EL. 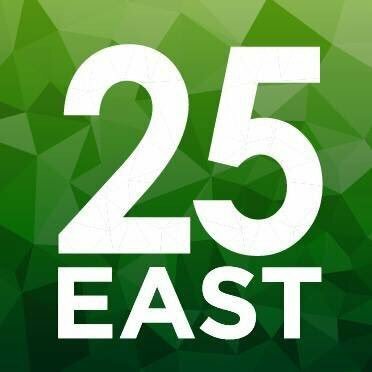 25 East is a great community to live in! From the awesome staff to all of their accommodations I would 100% recommend living here. I also love how active they are on their social media! My neighbors are loud af and get the cops called on them. The amenities are good when they aren’t broken. You get what you pay for here. Grounds are well kept and the location is convenient. The office staff and maintenance people have been very helpful. The community overall seems very nice and friendly. There is only reason I didn’t give a 5/5 star is because I feel like there’s minimal action taken for problematic roommates. My recent couple of months since I last reviewed have been great! I'm still really enjoying all the facilities, especially the gym and free printing. Everyone I've interacted with has been very friendly and accommodating. 25 east is definitely better from when I first moved in. They redid the floors and gave us new appliances. There are things that break without our doing though. The ac randomly doesn’t work all the time and our dish washer randomly started to fall out of place. Overall, for what I pay, 25 East meets my expectations for student housing. Sometimes things work and sometimes they don't, but my day to day living isn't majorly impacted. Overall the experience has been enjoyable. Maintenance has come by to fix all problems. The pros outweigh the cons with the cons being noisy at times due to the fact that you can hear the people above and sometimes through the walls of neighboring apartments. The maintenance staff is wonderful. At the beginning of my lease there were some issues that weren’t handled by the leasing staff until the 5th or 6th time I asked them to help. Overall, for the price, this place is good. Has been a great place to live during the 2018/2019 school year. It's been a snowy one and most of the time the areas are plowed. Nice people, and management has been helpful.